Dr. Mark Lythgoe, Magnetic resonance image (MRI) used for the project Mapping Perception, 2000. 3 Dimensional functional MRI of Mark Lythgoe’s head. 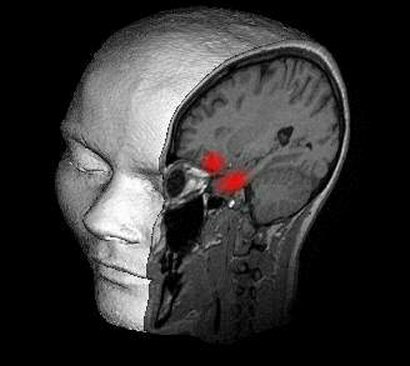 The red area indicates the region of the brain active when smell is tested in a subject during an fMRI scan. Courtesy of Dr. Mark Lythgoe, Institute of Child Health and Proboscis. Proboscis is a non-profit group based in London, England, that functions on a project by project basis, in collaboration with independent curators, scientists and artists and with such organizations as universities and galleries.